Transit was the first and longest-running series of navigation satellitesnavigational satellites. Transits enabled nuclear submarines and surface vessels of the United States Navy to fix their position at sea, to within 150 meters in the early days of the system and to within 25 meters later. The first successful Transit, Transit 1B, was launched on April 13, 1960, to demonstrate the feasibility of using satellites as navigational aids. Four years later, the Navy put its first constellation of spin-stabilized Transits into operational service. Later Transits used gravity-gradient stabilization and were also known as Navy Navigation Satellites (NNS, or Navsat). Although Transit stopped being used for navigation on December 31, 1996 – its role superceded by NAVSTAR-GPS (global positioning system) – the satellites continued transmitting and became the Navy Ionospheric Monitoring System (NIMS). A Transit receiver used the known characteristics of a satellite's orbit and measurements of the Doppler shift of the satellite's radio signal, to establish an accurate position on Earth. An operational system consisted of six satellites (three in service plus three on-orbit spares) in 1,100-kilometers polar orbits, three ground control stations, and receivers. 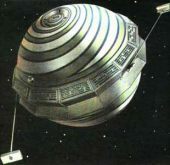 The constellation eventually consisted of two types of spacecraft, the 50-kilogram Oscar, with an average operating lifetime of 12 years, and the more advanced, 160-kg Nova, with an average lifetime of nine years. The last Transit satellite launch was in August 1988. Day-to-day operations, including telemetry, tracking, and control were conducted by the Naval Space Operations Center at Point Mugu, California, while the Applied Physics Laboratory at Johns Hopkins University devised and designed all aspects of the Transit satellites.